Smiley Face Serial Killer No Longer At Large? CNN’s Anderson Cooper laid out the case in hushed, grim tones in a story that even hit CNN.com’s “front page”: college-aged men all around the country have been drowning under mysterious circumstances since 1997. And as two retired NYPD detectives started to put the pieces together, they realized that “creepy” smiley faces have been found nearby at many of the scenes. And before long, the profile emerged: serial killer with a distinctive signature; preying on young, intoxicated men; and he’d been killing for more than a decade. It was enough to send chills down the spine of many readers. Over at Skepchick, however, blogger Elyse has a different take: the hype just doesn’t pan out and the whole smiley conspiracy appears baseless. A case of impassioned officers trying too hard to make sense of too many tragedies at once, and improperly judging the statistical likelihood of several linked events. Put all that together and you have something that isn’t even an eerie coincidence: it’s pretty much a mathematical inevitably that some feature, in fact, some piece of vaguely similar waterside graffiti would connect some drowning cases, especially if you could look at any case from 1997 to the present, pretty much anywhere in the country. If this is really all the investigators have to tie the cases together, it’s no wonder at all that the FBI isn’t impressed. Their additional claim that each case has “mysterious” elements doesn’t help matters. While it’s statistically common that some young men in the U.S. will drown, it’s not at all a common or normal event in someone’s everyday life: some set of out-of-the-ordinary factors are likely to play into how each drowning happened, and in the cases where young men just vanished, and may have gone into the water alone with no witnesses, there will of course always be many unanswered questions about the circumstances. Maybe there is a serial killer out there, or a cabal of them (an even more unlikely scenario that the investigators nevertheless seem to favor). But if so, they’ve managed to commit their crimes in a way that looks almost completely identical to what we’d expect to find if none of the cases (whether they were individually murders, suicides, or accidents) had anything to do with each other. This entry was posted on Wednesday, June 11th, 2008 at 3:30 pm and is filed under Crime, Drugs, Government, Media, News, Police, Skepticism, Tragedy. You can follow any responses to this entry through the RSS 2.0 feed. You can leave a response, or trackback from your own site. 50 Responses to Smiley Face Serial Killer No Longer At Large? What you fail to mention is that in most drownings the people were actually swimming. What is the likelihood that a person drinking then decides that yes it is now a good time to go swimming. To not think something strange is going on is absolute ridiculousness as these are not statistical drowning events. Usually people do not go alone after an evening of drinking to the local (or in some cases just the nearest body of water) swimming area. I would also suspect that if these were college age women that the FBI and local police forces would have acknowledged that somethilng strange was happening and a task force would have been set up already. What is the likelihood that a person drinking then decides that yes it is now a good time to go swimming. It’s very good actually. In fact, this is a very common and dangerous situation. Intoxicated people often do things impulsively, and jumping into bodies of water seems to be one of them: only to realize that swimming and fighting a current takes more coordination than they presently have. To not think something strange is going on is absolute ridiculousness as these are not statistical drowning events. But neither you nor the retired investigators have offered enough evidence to suggest that anything strange is happening, at least in a connected way. People, sadly, drown accidentally all the time, especially when drunk. And some people commit suicide. And some are even murdered (some of these cases may, in fact, have been individual cases of murder). The point is that there is no real evidence tying these cases together: the smiley thing is just too common given the huge population of drownings that happen every year in the country, and given that the “search space” for smiley faces includes virtually any design of smiley, at an undetermined distance from a suspected spot of the victim’s entry into the water. Amy Piehl (KSTP) has made quite a name for herself with this story. I remember when it first broke. A GANG of killers traveling around the country killing college boys and throwing them in the river, leaving smiley face graffiti behind. I thought it sounded ridiculous, but I figured that they wouldnt claim it unless there was solid evidence and facts. So I watched KSTP for several nights, and of course there was NO solid evidence or facts. Just a couple of crackpot ex-detective drumming up publicity for themselves (i’m sure a book is forth-coming). And as I figured, the story just stagnated and you hardly hear anything about it anymore. Aint we a bunch of suckers? I have read quite a few aticles on the Smiley Face Killers. If people don’t see a connection they are retarded. But that seems to be the theme of this country people living blind to what is going on. No there is no bloody glove, or finger print left at the scene but the victims were all so similar to one another. Until one of the victim’s is a son of a politician, or this country’s elite this case will not be looked at closely and that in itself is pretty sad. Every one of these drownings was looked at individually. Until there is some sensible reason to think that they are linked, however, there’s no reason to suspect that they are a conspiracy. Larry King on CNN featured the case of Patrick McNeill and new evidence that a famed pathologist says proves Patrick was murdered in 1997. Click here to watch the Larry King interview. This is the first time that former FBI Profiler, Candice DeLong and Dr. Wecht have commented on the case. I want to highlight the new information they shared, but I encourage you to watch the segment that also interviewed Patrick’s parents, former detectives Kevin Gannon and Anthony Duarte and Prof. Lee Gilbertson. During the segment, Dr. Wecht said that fly eggs found on McNeill prove the Fordham College student was dead before he went into the water. WECHT: I’m saying that the fly larvae have been laid in the groin area. It’s an indoor fly, could not have been an outdoor fly. It was an indoor fly. And the larvae were there, did not move ahead into the later stage. So we have a body that was already dead before it was placed in the water. KING: I got you. You’re saying he was murdered? WECHT: I would call it a homicide, yes. KING: Were you impressed with what Dr. Wecht had to say? CANDICE DELONG, FORMER FBI PROFILER: Yes, regarding that particular case in New York, that certainly does sound like it was a homicide. I, however, fail to see the connection between the New York case and these other midwestern cases. Perhaps we could learn. DELONG: Well, the FBI’s Behavioral Science Unit looked extensively at this, in addition to using their violent criminal apprehension program, which is a computerized tracking system. And they don’t see any links. I don’t know if the two New York detectives have met with the profiling unit or not. And unfortunately, it’s sad but true. Now notwithstanding the Patrick McNeil (sic) case, sadly, a lot of young people do die of accidental deaths, many times drowning, on our college campuses throughout the nation. WECHT: Larry, first of all, if I may say from a forensic, epidemiological stand point, as you pointed out in your introduction, the statistics are so stacked against this number of men, young men, Caucasian males, found in bodies of water in that cluster of states, within that period of time. Of course, there are statistical aberrations, I realize. I just wanted to point out that to the epidemiologist, it would be a weird case. WECHT: From the forensic pathology standpoint, with regard to Patrick McNeil (sic), we have a young man who is found — he has a blood alcohol level of 0.16. Probably a third of that is postmortem putrefaction, a quarter to a third of that. So we have a relatively low level of alcohol. There’s no way in the world that this man then accidentally is going to fall into a body of water, because he as a 0.1 or a 0.12 level of alcohol. Why didn’t we realize this before? To each family, a missing piece of jewelry may seem insignificant or they may not even realize it is missing. Of the families that we’ve asked so far, only one told us that their son’s jewelry was not missing. His neck chain was not adorned with a religious symbol or medal. Many families of drowning victims are comparing notes and discovering similarities. Bill and I just realized that victims are being recovered with their clothes, wallets, college ID cards, but not their religious neck chains. So far, we know of missing crosses, Saint Christopher medals and Saint Patrick medals. If you know of a family who believes their son’s death could be connected to the others, please pass this on. We’re curious to find out how many other young men may have been recovered without a beloved piece of jewelry – especially a religious neck chain or medallion. Sorry that last article is backwords. Read the last few paragraphs,then the first couple. Josh Szostak was last seen on surveillance outside a bar in downtown Albany, NY on December 23, 2007. His case is closed and the Albany Police maintain that Josh’s death was a tragic accident. * On the tape, Josh walks outside the bar and is talking calmly with a friend. All of a sudden, he rips off one of his shirts and struggles to tie it around his waist. Then Josh doubles over, stands up and can barely walk. He struggles with his phone and stumbles down the street and is never seen alive again. * There are surveillance cameras recording all along the streets between the bar and the water. According to a police report, Josh was NOT seen on any of them. Detectives have not explained how Josh got from downtown Albany to the water. * The pants that Josh was wearing on the night he disappeared appear to be different than the ones he was wearing when he was recovered. All of Josh’s clothes were returned to his family. However, the pants are missing. None of the investigating agencies can account for the whereabouts of the pants. * The celtic cross neck chain that Josh always wore is missing. * Josh’s cell phone had 8 voicemail messages on it when it was found. The police report says there were no text messages on his phone and does not specifically reference the voicemails. When it was returned, Josh’s parents say the phone didn’t have any messages on it. Several postings on this site suggest a Native American link between the drowning deaths. In the Midwest, Native American influence is seen in the names of many cities, counties, rivers and lakes. So are these Native American links random or intentional? COSTUME: Chris Jenkins was wearing a Native American costume for Halloween. He was last seen in a Minneapolis bar and was recovered in the Mississippi River. RIVER: Josh Snell was recovered from the Chippewa River. COLUMBUS: Visitors to this site have suggested that Brian Shaffer’s disappearance from Columbus, OH has a Native American link. Christopher Columbus is credited with discovering America, but the explorer is also blamed for his poor treatment of the Native Americans. To anyone who has there doubts on these smiley face murders,all I can say is read all the articles you can find. Read all the websites that these different families have set up for there missing or deceased sons. Read what they have to say before you make your mind up. They know more than we do,of course,and there are many of those family members who are having a petition signed,right now,that has almost all the signatures needed to start an FBI investigation. There are so many families of these victims that are trying to be heard. Just take some time to listen then make your mind up. Did you know that all of the victim’s necklaces that have had crosses or St. Patrick medals or St. Christopher medals have went missing? Or that these murders never take place on a full moon and never happen during the months of July – October. I think that there has only been two in the month of June and they were both in 2005. Did you know that there are words being spelled out with the streets they find the bodies or where their belongings are left to be found later? A smiley face was found in all three of these cases. Notice that the first letter in the names of the towns spell out the word ARM. This was the location of suspected Smiley Face victim Brian Shaffer’s tattoo. Shaffer vanished from Columbus, Ohio in 2006. The ARM word begins in the exact town (Albany) that was crypticly linked by street names (Pearl, (Jam)es, Columbia) to the Pearl Jam tattoo on Brian’s arm. The Pearl Jam group once mentioned the Shaffer case at one of their concerts. The very next suspected smiley face death in December of 1999 happened in Chicago and is the begining of the COLD word. PIRE stands for Pacific Institute for Research and Evaluation (www.pire.org). They specialize in research on underage and college drinking. It is believed that the killer used PIRE as a cryptic clue due to the fact that the victims are often college aged drinkers. There is only about a dozen PIRE offices around the United States. I don’t believe it is a coincident that Brian Shaffer vanished from North High Street in Columbus, Ohio. There happens to be a PIRE office on the same street. Notice that the Pirfo name is close to PIRE. This was likely planned by the killer. Todd Geib was from Ravenna where he once attended high school, but his body was found in a rural lake northeast of town, close to a party he attended. Todd’s last known contact was at 12:50 AM when he made a call to say “I’m in a field”, then the call abruptly ended. This is similer to the case of missing Marshall, Minnesota student Brandon Swanson, who has not been heard from since his call also abruptly ended. It is possible that the killers are using cell phone jammers to keep a victim from making or completing a call. Willie Jacobson drown in Ithaca, NY on April 27, 2008. It was reported that Jacobson was from Minnesota. Two days after Jacobson’s death, the New York Daily News reported, “A spray-painted smiley face with a taunting grin could be the disturbing signature of a nationwide network of killers who target promising college students” and “They’re laughing at the police”. The very next suspected Smiley Face case was a college student from Marshall, Minnesota named Brandon Swanson. Strangely, his car was found abandoned near the town of Taunton, even though he told his parents that he was in a different county at the time his call abruptly ended. Notice the cryptic connection between the “taunting grin” and “laughing at the police” quotes from the newspaper. Taunt the police (Taunton-Marshall). Josh Snell was last heard from on the same day as Geib, but about an hour later. Snell called a friend on the evening that he drown to say that he thought that unknown people were following him and that he might be in trouble with the police. Local police confirmed that they had no contact with Snell, so this may have been someone impersonating an officer. The very last victim in the CAMP word has the name Campbell. The Smiley Face killer has left repeated similer partial names in his clues. This is more evidence that the killer sometimes stalks his victims and even knows their names. Mental impairment key to jury verdict on Stayner-Deliberations may begin this week in triple-murder case. Another strange thing about the NEMEC word victims is that a police bloodhound was tracking the same scent in both the Chris Jenkins case as well as the Josh Guimond case, which seems to indicate that the same person’s scent was found at both locations, even though these were in different cities and a number of miles apart. The Jenkins death was ruled a homicide. -A Gary Snyder poem about the deaths of young white males was left at the creek in Duluth where two young white male college students died. This poem was originally published in August 1968 in San Francisco. This is just a few months before the Zodiac Killer would go on a murder rampage around San Francisco. 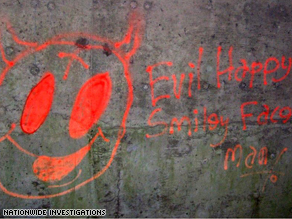 -Multiple Smiley Face death locations had graffiti that was similer to the Zodiac Killers drawings that he sent to various people in San Francisco. -Three murder victims of Cary Stayner had rented their car in San Francisco and were supposed to fly back to San Francisco, but were murdered instead. This is related to the NEMEC clue as explained above in the Word Patterns section. In October 3014, Anthony Luzio, Jr. was found dead inside his car in a retention pond near where he was last seen. Okay sorry for all the posts so fast like that…. I just want people to know more facts about the cases. When you know more of the facts,the picture becomes a little clearer…..these are not accidents. Ethnic/religious, intelligencia targeting, organized ritual murder of this nature is not as anomalous and unprecedented as many seem to believe. History is rife with it. That isn’t to say, this disturbing reality hasn’t been excised from most educational material, because it most certainly has. Asking why that is, would be a good start. That is of course if you are interested in de-fogging some of the underlying machinations and often uncomfortable nuts and bolts social realities affecting our world, both past and present. If not then I suppose you can simply chalk these deaths up to some crazed band of Native Americans, feminist zealots, or Christian’s hell bent on shooting themselves in the foot over and over again. Then of course there’s the Serial killer conspiracy game. This is not to say that no conspiracies exist in this world, because they most surely do, in spades I’ve no doubt. But I see a lot of people doing the Serial killer mamba, saying stuff like, Son of Sam said there was a ring of serial killers in the mid west. Dahmer liked to eat mid west omelette’s. Dahmer died at 34, 3 + 4 = 7. reverse it for 7 + 4 + 3 = 14 and add the middle number 4 again and you get 18, the number of women in the Manson family. Inane stuff like that gets you nowhere fast. If you want to find a genuine precedent for crazed religious murder for tribal profit or control, look at the thugees of India . However I wouldn’t blame this one on the thugees, as apparently their bloodline ended under British occupation to the delight of many caravan travellers I’m sure. I merely offer them as an example that people in tribal packs can act detrimentally towards others in ways that differ from say a blind riot, or a clumsy mob lynching. I’m sure one or two of you have caught on to the people I’m alluding to who I think are most likely responsible for these deaths. And for those of you who are unsure, ask yourself what is the only taboo in the west these days. Which says a lot as nothing is holy anymore, take a jab at Christianity, Islam, the nuclear family, love, ethics, nothing is revered. But there is one area of life or humanity free of any judgment, and ironically this taboo prevents any criticism of the source force for busting every other taboo around it. It has always been here, and it hates smart white Christians with a passion. It’s great that you took the time to write all this up; it’s encouraging to hear another’s opinion. I respect your work on this page, and I’ll return for more reading. As a sociologist, and ex-professor of sociology. Here is my theory on the smilng face murders. What if there is a serial killer, but in this case it’s a female preying on males. A female serial killer who was bruttaly raped in college, while on a date, or at a party by a lake, or water. The person who raped her was drunk. He forced himself upon her. He stronger than her. Maybe she was a freshman or sophmore. The trauma of what had occurred never goes away for her the victim. Maybe she was raped by an athlete in college. A frate boy who’s relatives were freemasons. It was covered up, and the girl simply left school tormented by her attacker. The girl grew up, and became an woman with sociolopathic tendencies. A hatred for young adult males who are athletes and college students. *As for the smiling faces, it is possible where she was raped a smiley faced appeared. This is a symbollic reminder of her victimization and never ending nightmare she now lives. Now when she scouts out “KILLZONES” these area’s on hikes, finding symbols of smiling faces adds to the high and the sport. To find areas where the smiley faces are already painted, adds an extra plus to the kill. Maybe this woman now has psychotic breaks and travels back in time to when she was helpless, abused, and faced an never ending stream of humiliation on college and with her parents. To add further insult, she never finished college due to the tragedy. This female is a hunter that targets these young adult males and waits until they are alone and isolated. She waits until that window of opertunity presents it self just before the bar closes, and then this woman offers herself to the young man. Our hunter/stalker already knows who these boys are, she stalked and studied them like a big game hunter would track a polar bear. Maybe for weeks? And then at the end of the night, our predator lures these males to a place of opertunity. Where all the variables are in her favor. This woman had already predetermined how she was going to bring down her pray. Maybe she taunts her prey seconds and minutes before they slip beneath the water. And smiles! She will take the man into the water. she is sober! And maybe acting as though she is drunk. Throwing her target off. After he slips beneath the water, she smirks, and swims towards shore or simply walks away. And no smart hunter, like her will continue to hunt in the same area. This predator moves, like a pather from state to state. I would be interested to hear any other info you have on these cases. In all likelihood the Smiley Face Murders are perpetrated by Jews, who throughout history have practiced ritual murder and blood sacrifice. Note that many of the cases occur just prior to Jewish holidays. For Passover, Jews have been known to use the blood of “Gentiles” in their matzah. It is not coincidence that Jews target young men, especially young white men, who are the gravest threat to their plan to exterminate humanity. Probably sounds like a bunch of gibberish, huh? Well if you do the research like I did, read about what the Talmud really says, read about Jewish ritual murder, read how Jews have covered up cases of ritual murder, note how these cases are not given a whole lot of serious attention in the mass media, controlled by Jews, and that Jews certainly have the means to execute these murders, it really isn’t that hard to believe. 回。 2000 年に Deckers オプラウィン フリー、U の女王に ルイヴィトン 財布のペアを寄付よろしく .